Mary’s YES to the Lord can seem incredibly daunting. How could Mary, as a young virgin girl, hop on board so easily? Why do I struggle so much with discerning God’s will for my own life? Why can’t I say YES in the same way? When Gabriel greets Mary he tells her that she is full of grace and that the Lord is with her. What wondrous words! God’s grace had already filled the Blessed Mother. And while this was her biggest YES to the Lord, it was hardly her first. 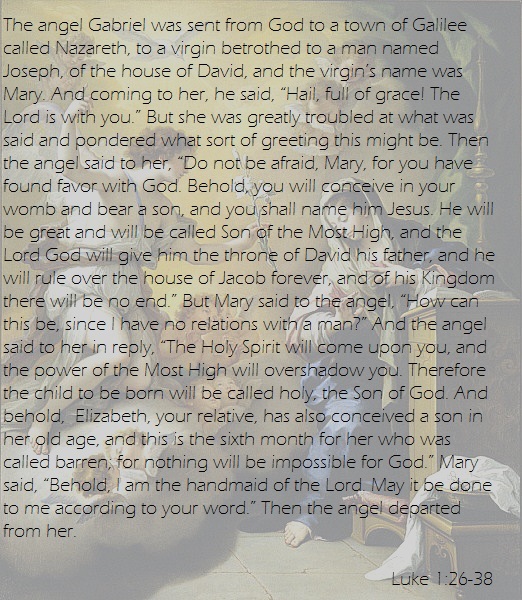 Gabriel tells Mary she has found favor with the Lord. She has been living a holy life, following the Lord, and placing her trust in Him. She was given a special grace from God to prepare her for this moment. In short, she was given everything that she needed to make this decision. Our God loves us. He does not desire to put us into situations we are completely unprepared for. Instead, He calls each one of us and is by our side constantly in life to prepare us for what He has in store for us. He gives each of us the grace we need to say YES to His call in our own lives. But as I am only human, there are times when I still feel confused by it all. Times when I want to know more, to understand what will happen next. Mary did not understand it all either. When Gabriel greets Mary, she is troubled and confused. Even after Gabriel tells her not to fear and that she will be the mother of Jesus, the Son of the Most High whose kingdom will reign forever, she asks, how? She wanted to understand. Eve wanted to understand, too. She was literally surrounded by God’s goodness, but she still wanted to know more. She wanted to know the how and the why of it all. She also had a choice to make, and she chose to follow her own path, to turn away from God. Rather than trusting in His promises, she took matters into her own hands, choosing sin over God. Mary didn’t continue to question the specifics of everything. She knew what she needed to know. And so she put her trust in the Lord and said YES. Sometimes saying YES to God means we can see it all clearly before us. And sometimes, saying YES means knowing that we need to trust in Him even when we can’t understand how it will all work out in the end. We may ask the Lord, how can this be? To ask Him this is to seek His guidance. And though we may not see it right away, He will always answer with whatever it is we need to know. Even if all we need to know in that moment is that nothing is impossible for God! Thanks! I know this passage always gives me hope and seeing it in this light makes me feel even closer to Our Lady, knowing she certainly must have had the same confusion and questions that we do in our lives too. God Bless! Beautiful reflection. I do have to say, though, that when I seek to follow God’s will and to trust in Him, I don’t often have a clear idea of what it is He wants of me. I know what you mean Reinkat! It’d be great if an angel showed up and told me what was coming next 🙂 Trusting without knowing is so hard but thankfully we know that what He has in store for us is greater than we can imagine and He won’t lead us astray if we just keep following Him! A post I truly needed to read!!!!!!!!!!!! Much wisdom and knowledge the Holy Spirit gave to on this one. I am like you and Reinkat. Turning this way and that, truly never knowing if it s the right turn or not. When I do the Scripture, “Be still and know that I am God,” always coming flooding into my soul. I can be still, but “knowing” He is God always presents the challenge to me.